Benny Ong: Strike Ã‚Â£95 Million! The advertisment has been running on the TV countless of times during the week and I have been ignoring it until today. When I was in the office, it was a topic of conversation and everyone asked me whether have I placed my bet on Euro Millions. The team that was in my office was kind enough to buy a ticket on my behalf and pool the sum together for a shared ticket as well. However, the odd of winning is 1:24 which means I can potentially walk away with some prize money. Well, I have bought my share of tickets on the way home by giving Song Yia and my family a call. Each one of them gave me a set of numbers which I place a bet on. Each entry cost Ã‚Â£ 1.50. I have to declare that I don't have a gambling problem but 95 Million is just to good of an offer to refuse. 4 Chances of Winning GBP 95 Million! Now, let me dream about what I want to do with all that money! GBP 95 Million equals to RM 597.235 Million. 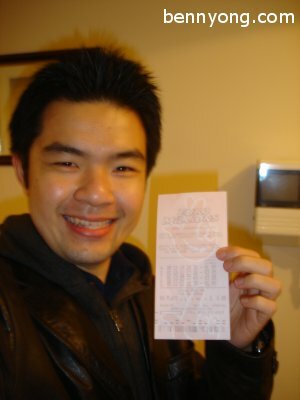 (est 6.3 forex rate) I will share my winnings with my loved ones and a generous sum to charity. I hope you win too~ All I want is a designer hangbags and shoes! With all the luck you have, Im pretty sure ur chances are high!